We LOVE our TotoPAWDSTM and dogs do, too! They offer a wide array of applications including fitness, positioning, balance, proprioception, stretching and targeting. The Nubby TotoPAWDSTM are strong, yet soft enough for sensitive paws. They are multi-purpose in that they can be used along with our Stabilizing Poles to help hold an Infinity in place. Or insert a longer pole and use the TotoPAWDSTM for figure eight or weave exercises. 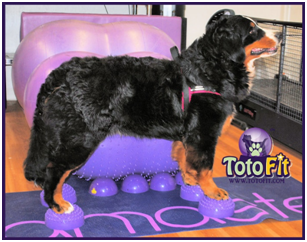 The Smooth TotoPAWDSTM are slightly smaller in diameter and offer a great alternative for dogs with very sensitive paws. They have a tactile surface to assist with grip and are a bit more challenging for balance exercises than the Nubby TotoPAWDSTM. 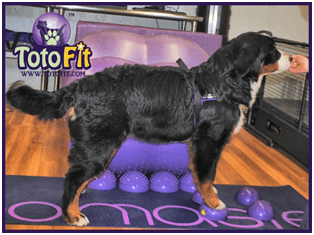 Fitness: Standing on either the Nubby or Smooth TotoPAWDSTM offers a method of building a dogs’ core strength while working on the flexors of the digits, carpus and hock. Weight shifts forward and backward accentuate this work. Our TotoPAWDSTM adhere nicely to the floor or to another piece of equipment. For example, to increase the intensity of the workout, you can place the TotoPAWDSTM on top of the Disk. Positioning: The perfect stand or stack is often sought after from young puppies to adult dogs. TotoPAWDSTM offer an alternative to other conformation stacking products. The forelimbs and hindlimbs are placed on the four TotoPAWDSTM, and the dog holds the position for safe periods of time. 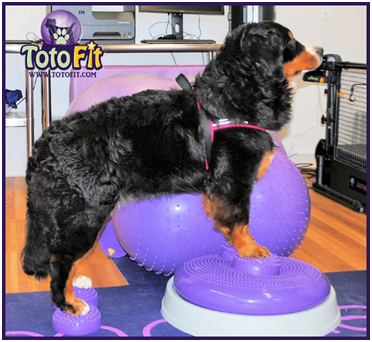 Unlike other techniques, our TotoPAWDSTM offer the benefit of adding in core conditioning, balance and proprioception. Balance and Proprioception: Research has demonstrated that balance and proprioceptive exercises are the key to successful sports performance and activities in humans. We can deduce the same is true for our dogs. 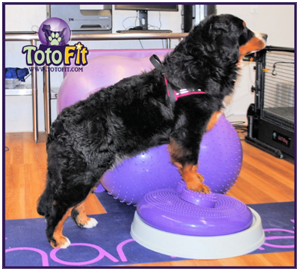 TotoPAWDSTM offer a safe way to work balance and proprioception. You may begin with the front feet on the Pawds, the rear feet on, or all four at the same time. Some dogs need to begin slower until their balance improves. The tactile input of the Nubby TotoPAWDSTM is great to start with because it assists with strength and proprioception. The Smooth TotoPAWDSTM will be an increased challenge, as the dog begins to improve its balance. Standing activities are great to start. Weight shifting, head movements and longer stands may be utilized to accentuate the activity. Stretching: Standing on the TotoPAWDSTM and reaching forward offers a combination of muscle control and stretching. For example, if the dog is standing on the TotoPAWDSTM on all fours and leans forward, the dog is contracting the hip flexors and shoulder and elbows flexors eccentrically, while elongating the muscle tissues. This is a very useful exercise for dogs returning to activities and for preparing dogs for a variety of sports. It is a more difficult exercise than gentle weight shifting back and forth and requires that the dog use core muscles to hold its paws in place. Targeting: Both the Nubby and Smooth TotoPAWDSTM offer a perfect object to target. Whether you are working on hindlimb and forelimb awareness, abduction and adduction exercises, or pivoting with small dogs, they work wonderfully as targets. In addition, the dog is able to gain strength from their contact with the TotoPAWDSTM. Specific Strengthening: I recommend all dogs exposed to a variety of surfaces work with TotoPAWDSTM to help strengthen the intrinsic muscles of the digits, carpus and hock. For example, racing Sighthounds, Schutzhund dogs, herding dogs, and agility dogs should possess great strength in their digits to prepare for uneven ground and prevent problems with their toes. Our TotoPAWDSTM are portable and can be easily be transported everywhere you go with your dog. There are no excuses not to exercise on the road with them! Either solo or as a combination with other equipment, we consider them an essential component to every dogs’ fitness program. Check out our Nubby and Smooth TotoPAWDsTM Now!